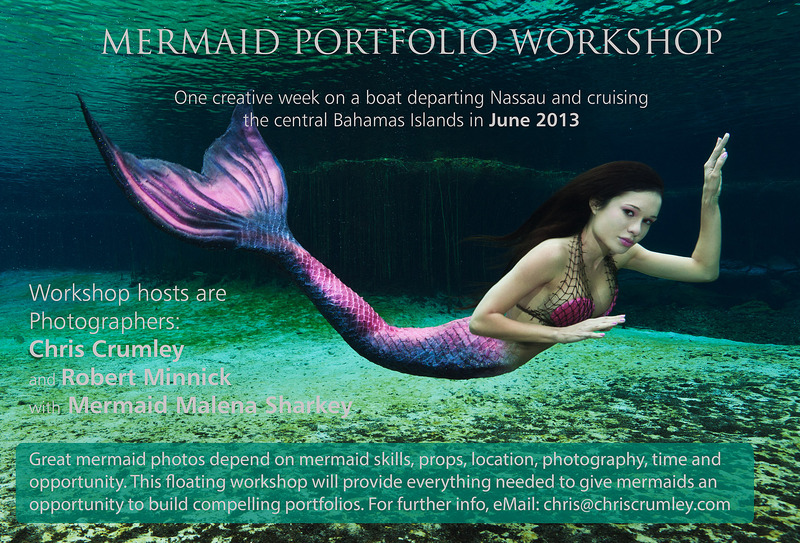 Underwater Photography Magazine (UwP66 issue) also has this full page ad for a unique mermaid portfolio-building workshop. Two photographers, Robert Minnick and me, host a dozen mermaids on a boat cruising the central Bahamas teaching modeling technique and photographing the mermaids in a week-long variety of exotic island, sand, water and underwater locations. The mermaids depart the boat with a healthy dose of fresh air and sunshine, new friends with similar interests and image additions taking their portfolios to exciting new levels. Mermaid in the ad is Ashley Nadine in central Florida's Rainbow River Headspring. Tail by Eric Ducharme (themertailor.com).